I’m not sure that I’ll ever make Chicken Parmesan the “real way” again! We loved this “easiest ever” version so much - it’s all the same amazing flavors, with a fraction of the fuss in putting it together. This one will soon be on your regular meal rotation, I know it! Seed and slice the red bell pepper. Place the chicken tenders in the base of the slow cooker and sprinkle the sliced white mushrooms and red bell pepper slices over the chicken. Pour the marinara over the top, then sprinkle the Italian seasoning and a pinch of salt and pepper over the top. Set on low and cook for 8 hours. Once cooked, strain off any excess liquid and then shred the chicken into the marinara. Add the shredded mozzarella cheese over the top and let melt. Then add dollops of ricotta cheese, and some grated Parmesan cheese on top. Cook the pasta as directed. 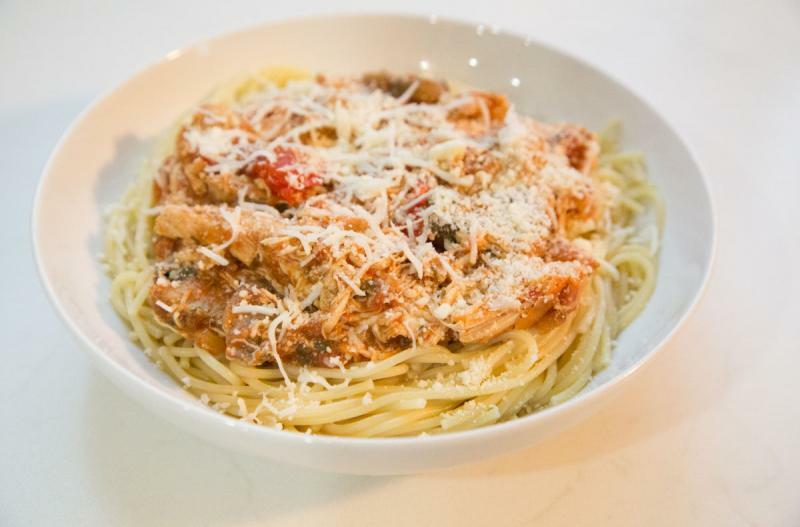 Serve Slow Cooker Shredded Chicken Parmesan over pasta with side salad. Seed and slice 2 red bell peppers. Do NOT add the cheeses before freezing. Put baggie in the freezer and freeze up to 6 months in fridge freezer or 12 months in a deep freezer. Thaw in the fridge overnight, or a warm bowl of water for about 20 minutes, before transferring to the slow cooker and cooking on low for 8 hours. Top with cheeses at the end of cooking cycle, as directed. Unfortunately, there is not a great dairy-free option for this sandwich. Recipe is gluten-free when served with gluten-free pasta. Thaw and slow cook on low for 8 hours. Strain and shred the chicken into the sauce. Top with shredded mozzarella, ricotta and grated Parmesan cheese after cooked. Serve over pasta with side salad.